A mini stepper has various health benefits. This is a convenient piece of equipment that will get you active without taking up too much space. Whether at your home or office, using the best mini stair stepper is an effective way of helping you achieve your daily fitness goals. Today, we’ll help you choose a mini stepper machine. They have been around for some time, but not many people take them seriously. A mini stepper machine is the smaller version of the stepper machine. Since it is smaller, it can be moved to any place around your home or office. This machine simulates brisk walking or climbing stairs. It will give you similar benefits to that of a full size stepper machine, but you won’t be dealing with too many settings or handles. What about using dumbbells, ankle weights, and weighted vests? As a cardiovascular machine, this unit will provide benefits including helping to increase your heart/cardiovascular health. Did you know your body can burn as much as a 100 calories an hour on a mini stepper? When you increase the speed of your steps and add in dumbbells, you can increase the number of calories you burn which can help you start seeing weight changes in around two months after you start using it without changing your eating habits; although adopting a healthy diet will dramatically speed up this process. 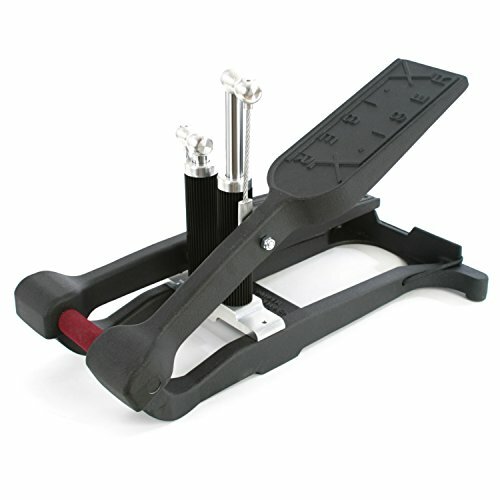 A mini stair stepper usually has two independent pedals. You will start your activity by stepping on the pedals and simulating the action of climbing a hill. Repetitive motion causes your heart and lungs to work hard to maintain the motion. This results in an aerobic exercise that improves cardiovascular health. Such benefits include lowering your blood pressure, controlling glucose levels and boosting your immune system. The mini stepper machine is a form of low-impact exercise. You can work out on it for up to an hour without putting extra strain on your joints like you would in a high impact cardiovascular exercise like running. A mini stepper is small, and you can use and store it anywhere. 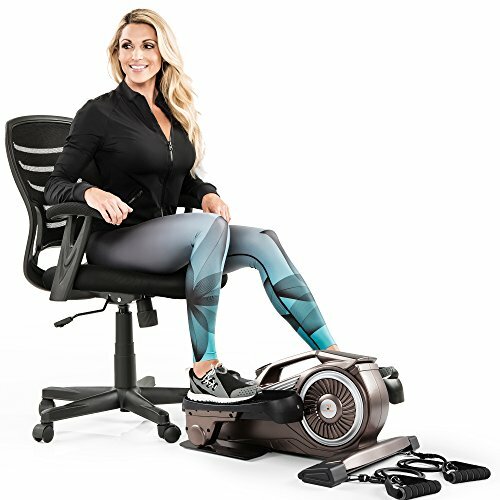 The machine will provide unobtrusive exercising because you can use it without distracting your coworkers or in front of the TV without waking up your kids. If you want to get the best workout from a mini stepper, you need to integrate more routines in your workouts. Climbing, pyramid training, and interval training are some of the exercises you could do on a mini stair master. Interval training starts by setting the mini stepper at the lowest setting and using it for 10 minutes. Then, increase your pace like you are jogging for the next 10 minutes still at the lowest tension. Next, increase the setting to a high pace and exercise for at least three minutes and then resting for five minutes by lowering the setting and climbing at a comfortable pace. Increase the setting for the next 2 minutes and climb slowly for five minutes as you finish your exercise. You can also do this exercise routine in reverse starting from high intensity to the low intensity. 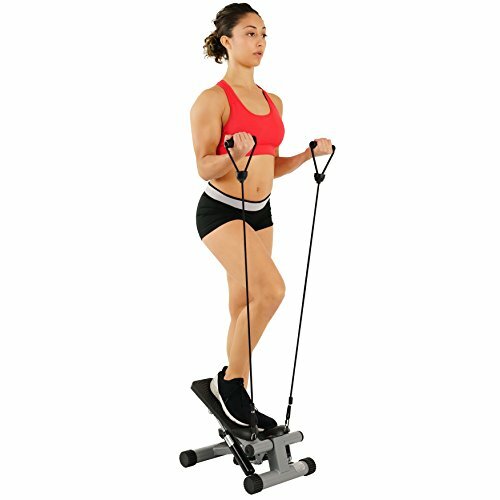 A mini stepper with resistance bands increases versatility in your exercise. Resistance bands provide a total body workout instead of just working your legs, you also get to tone your arms and upper body in the process. The Xiser Mini Stairmaster comes at a premium price but for a good reason. From its ergonomic design to the high weight capacity, and the fact that it is super quiet, you will appreciate every feature on this mini stepper machine. This model is built from aircraft grade aluminum. It does not have many parts which means it is very unlikely to break. The sturdy construction also allows it to accommodate more weight as it can support up to 400 pounds. It is just the perfect way to start shedding weight and getting the body you want. This machine does not have handles. It comes with the advantage of using your core for balance. It may be difficult at first, but once you get around to balancing, you are going to work out your lower body and your core at the same time. 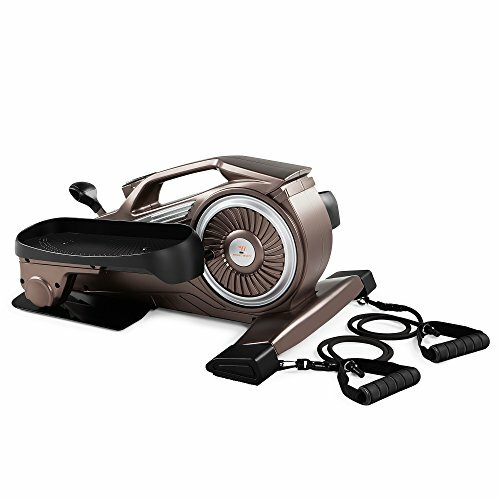 The Xiser Mini Stairmaster is adjustable in three levels; low, medium, and fast. It adjusts effortlessly with a screwdriver. The Stairmaster will assemble and disassemble for storage. You will also be able to use it with a standup desk thanks to its ergonomic design. If you want a complete cardiovascular workout on a budget, the Sunny Health & Fitness Mini Stepper with Resistance Bands is an excellent choice. It is a robust model made of steel to give you years of use. The machine will provide you with a total body workout thanks to the additional resistance bands that train the hands, shoulders, and upper body. With the slip-resistant foot plates, you will feel comfortable as it can accommodate large feet up to a size 12. The machine has a weight capacity of only 220 pounds. It restricts usage by heavier persons, so you will want to make sure you are under the weight capacity. You can adjust the height for either short bursts or long steps. By increasing your pace, you will improve your heart rate and oxygen intake quickly. 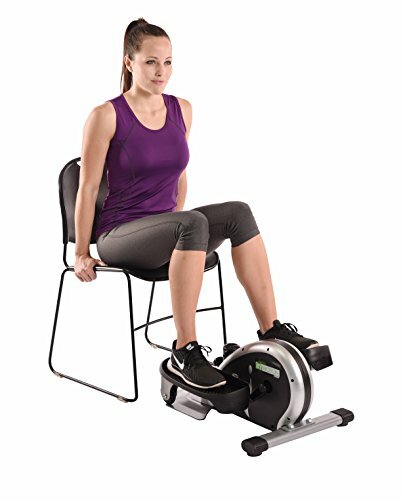 The Stamina In-Motion Elliptical Trainer promises to engage more muscles without hurting your knees and ankles. 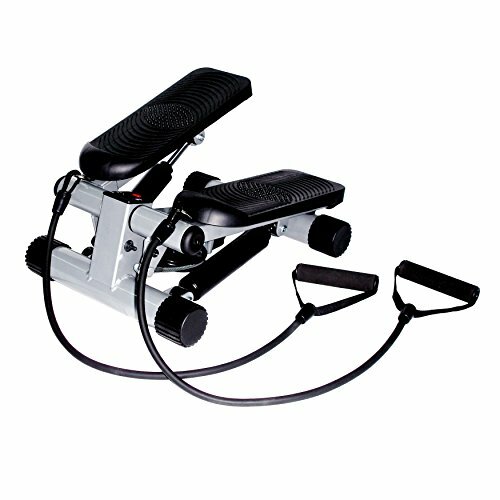 It is a versatile machine in that you can use it standing, seated, and it can be pedaled backward or in a forward. Compared to the Bionic Body, this mini stepper is easier to move because it has less weight at 24 pounds. Its height allows it to be used as an under-desk cycle too. Now you can get your legs moving and your heart racing when you are stuck behind a desk. You will like that this machine comes with non-slip pedals as well as a digital monitor. It allows you to track your workout so you can easily know when you have achieved a set goal. Not to mention, it is quiet which means you can use it in an apartment or a home where you don’t want to disturb your family members. You will, however, need to carry out proper maintenance like lubrication and tightening the bolts to keep it in top-notch working condition. This mini stepper promises a great workout. It is best used as an under desk cycle because it can fit under standard office desks. It works out the legs muscles which increases your heart rate in the process. It will also serve as a unit you can use while watching the TV or with a stand-up desk. 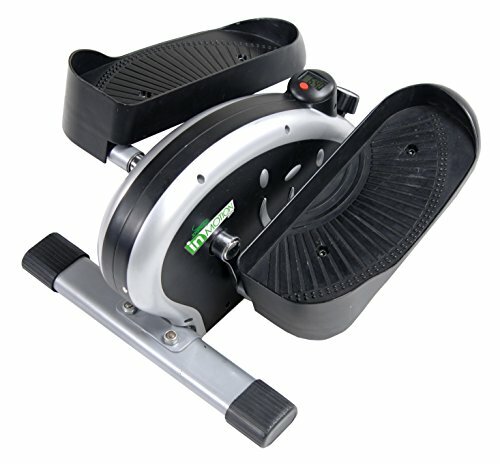 With this mini stepper, you can turn any room in a personal training center as it has a small and compact design. The resistance bands allow working out of the upper body which will give you a leaner and slim-looking body much faster. 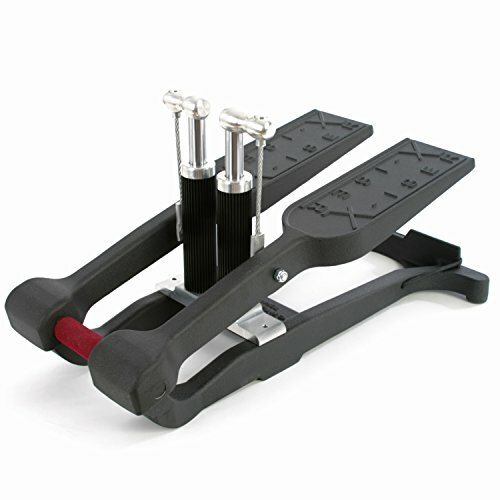 The adjustable resistance level comes in handy to control the intensity. It helps you to workout harder or vary your workout by using different tension levels. With the non-slip pedals, your focus will be on your workouts instead of worrying about losing your grip. This machine guarantees longevity because of the stainless steel construction. It is a remedy for improved health and fitness wherever you chose to use it. This is the most popular design as it allows you to achieve the climbing position but you will be pushing the steps down. this makes you work harder hence your burn more calories in the process. This kind of stepper allows you to engage more muscles in the body. They achieve deeper stepping which provides an excellent cardio workout. It is aimed at being more low impact than the traditional mini stepper machine. Being able to adjust the tension level either through resistance dials or tension bands is essential. Whether you are a beginner or just looking for a machine to engage your body at home, you will want to start climbing at a comfortable tension then you can work your way up with more tension and intensity. It is a good way to improve your workout by challenging yourself using different tension levels. To increase the challenge even further, you can include weights in form of dumbbells, a weighted vest, or ankle weights. Adding any types of weight will increase your heart rate and your cardio vascular health as well. If you choose to use a weighted vest, you will want to start with as little as 10 pounds as using a weighted vest increases the challenge 3x. You don’t want to risk overexertion when you want to go easy on the joints and are just starting out. Ankle weights can be used with any workout routine. 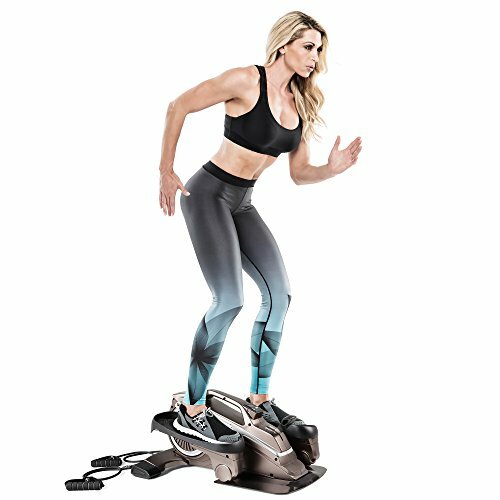 With a mini stair master, you can burn more calories, but you risk putting more stress to the ankles and knees so you should never overdo the exercises. Some of us are worried about using a mini stepper in the office because of the noise. Some steppers can have a high amount of noise that can be distracting to coworkers. If you notice the noise level from your machine is loud, you may want to inspect it to ensure that all its bolts are tight and that it is lubricated. You may also want to place a thick rug underneath it as it will absorb the noise to a great extent. A mini stepper without handles can be used with a standing desk. It is a nice way of adding activity to help augment your days behind a standing desk. Using a mini stepper machine isn’t that hard. But choosing the best mini stepper machine can be a tricky process. 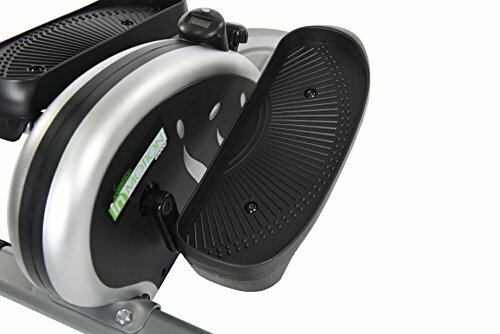 If you are looking for the top-performing mini stair stepper without worrying about the price, the Xiser Mini Stairmaster is a good fit. It has durable construction, and the resistance levels are adjustable to increase your workout intensity. Being on a budget should not keep you from enjoying low-impact exercise as you can have the Sunny Health & Fitness Mini Stepper with Resistance Bands. And if you want one for your office desk, we believe you can’t go wrong with the Bionic Body model.